Two weeks into the new year, we celebrated my younger daughter Tess’ 8th birthday. 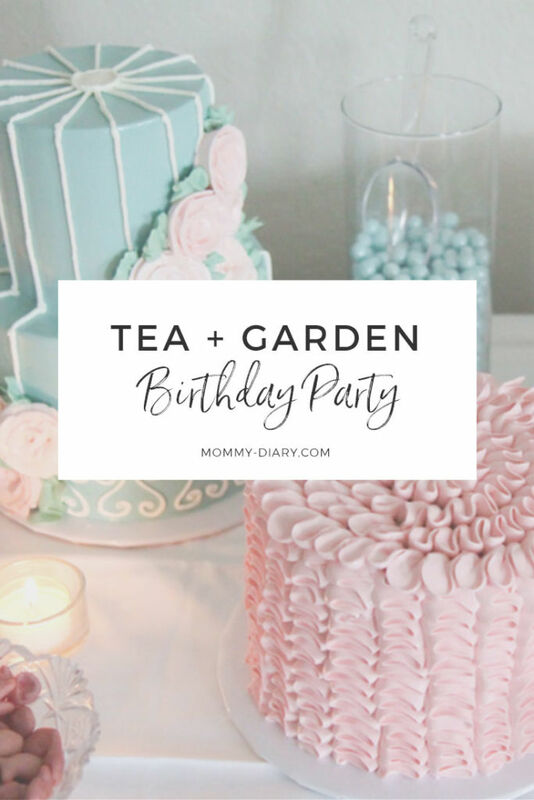 When she said she wanted a garden tea party, I was ecstatic because I knew I was going to have so much fun planning. As you can tell by browsing my blog, I love vintage glamour with a touch of history and femininity. I love English rose gardens, antique furniture, white sheer curtains and natural sunlight. I’m not much of a gardener (perhaps a new hobby in my 40’s?) 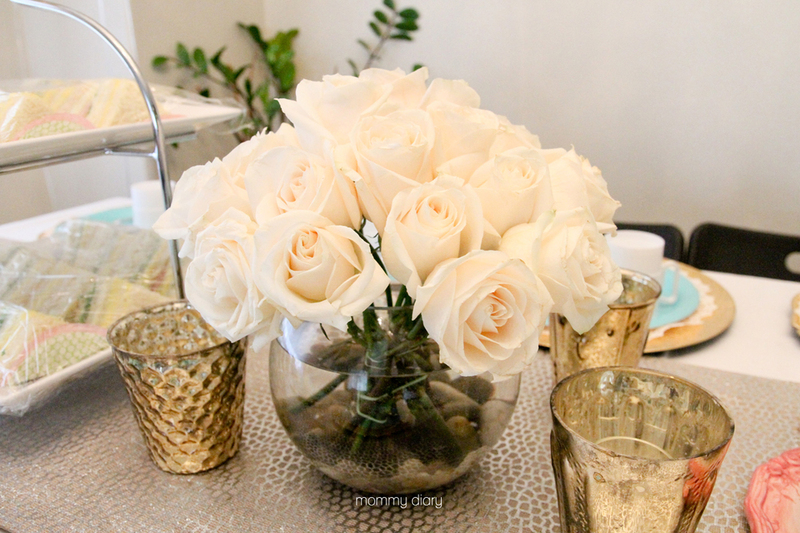 but believe one can never have too many candles and rose arrangements throughout the home. 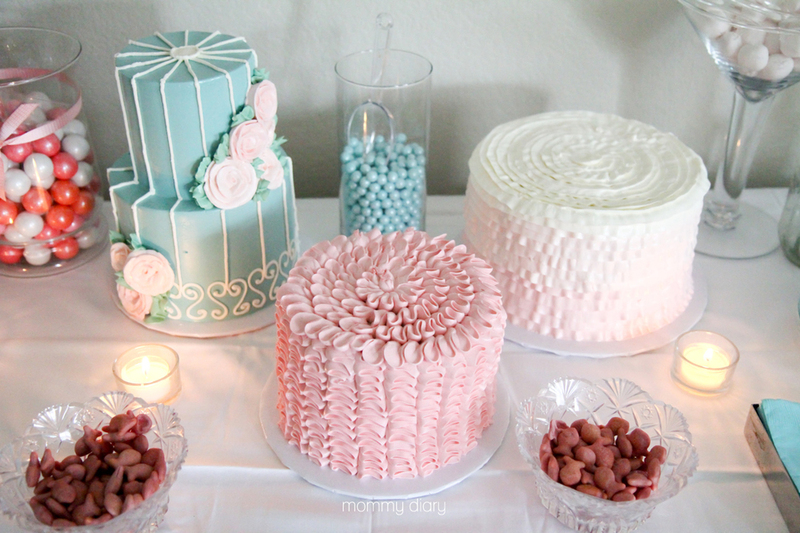 Anyhow, I began party planning just three days before while remembering more joy and less worry. I didn’t want to stress myself out over trivial details and forget what’s most important at my child’s birthday party. Our baby Tess was turning 8, growing into a healthy, happy and beautiful little girl. Plus we are incredibly blessed to have such amazing friends in our lives and all I needed to focus on was being a generous host with lots of love and joy to share with our guests. Rose teapot: hand-me-down from my mother. 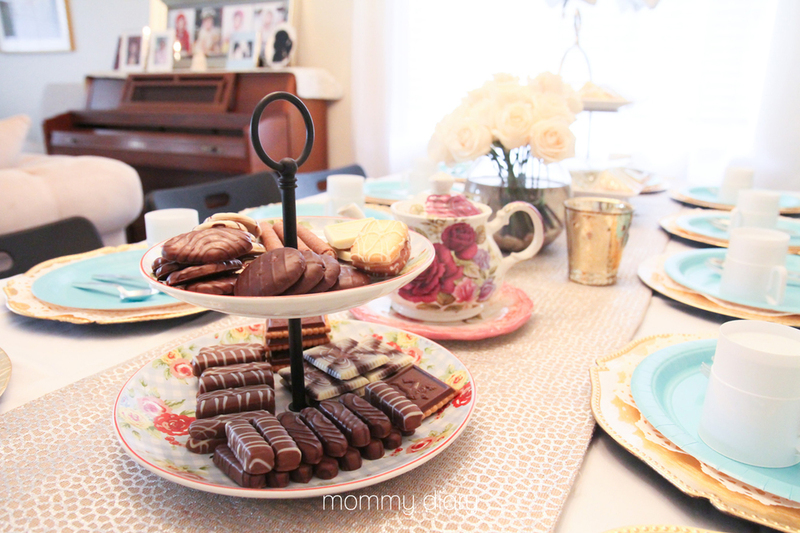 Two-tier tray & table runner: Homegoods. Gold charger & votive candle holders: Kirkland’s. Plastic cup, flatware & plate: Party City. 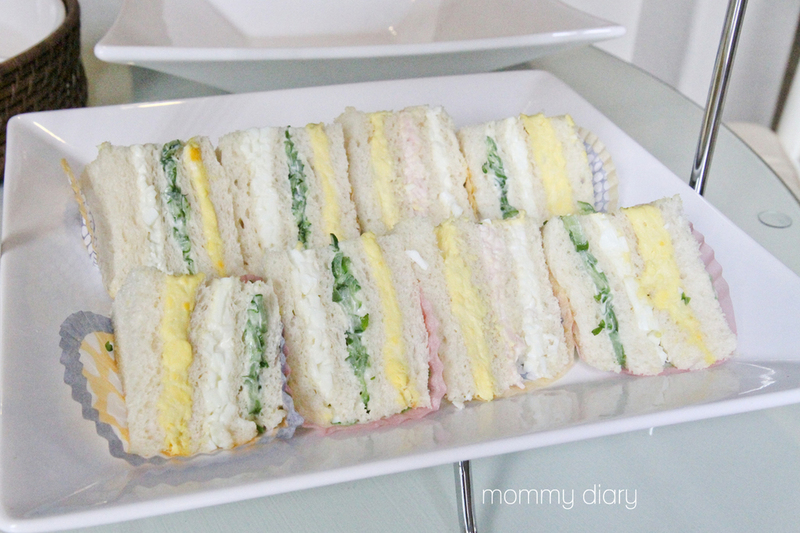 Mini sandwiches with Egg yolk, egg whites, cucumber, turkey and cheese. DIY Rose arrangement. Read tutorial here. 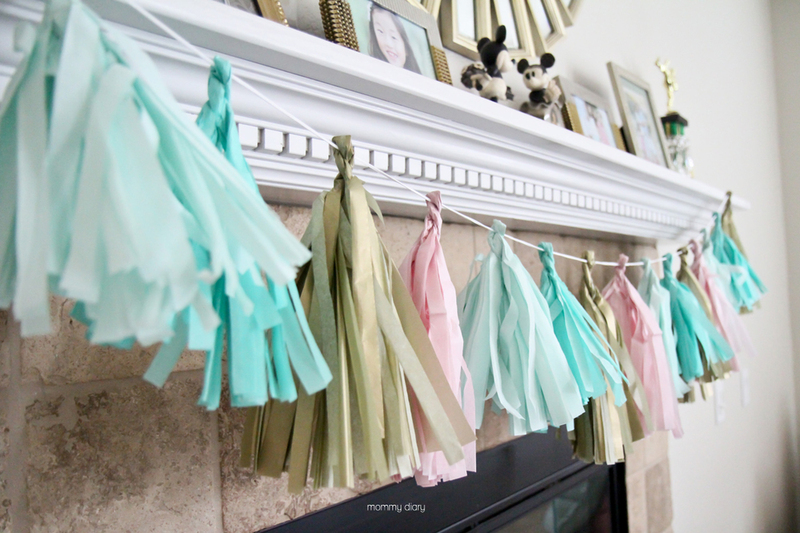 I made fringe banners while catching up on my favorite TV shows, made a few trips to Party City, Michael’s and Costco— and pulled out old collections of rose-themed plates and teapots. 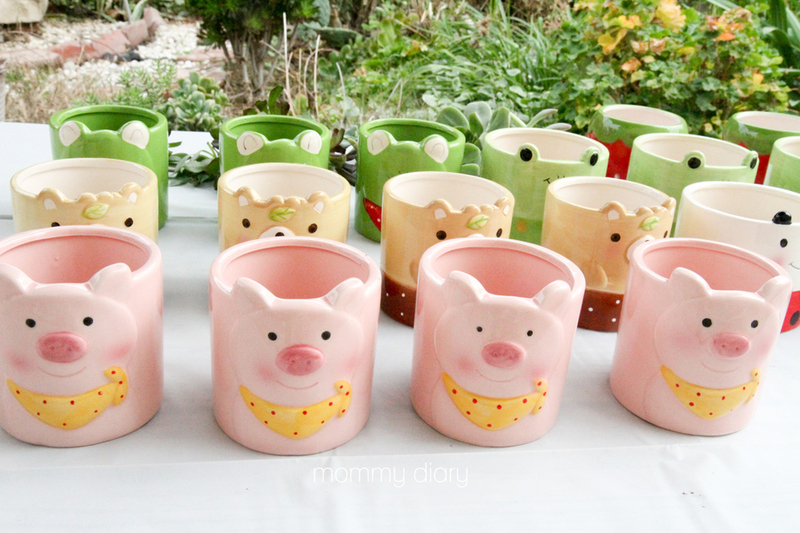 Cute character pots from Daiso. I gave these away as favors. I purchased soil from Home Depot for less than $10. Succulents @ $2-3 each. I already had some in my garden. 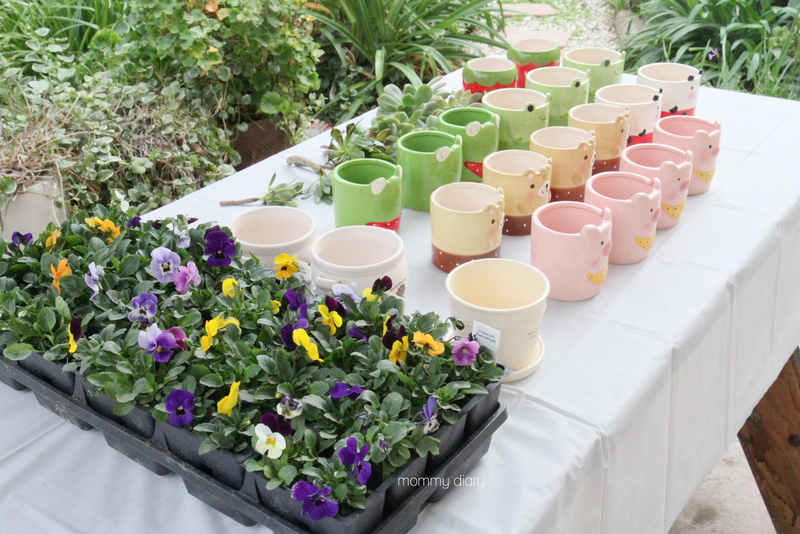 Tess loves to garden so we decided to prepare little pots everyone can plant with flowers, seeds or succulents of their choice. 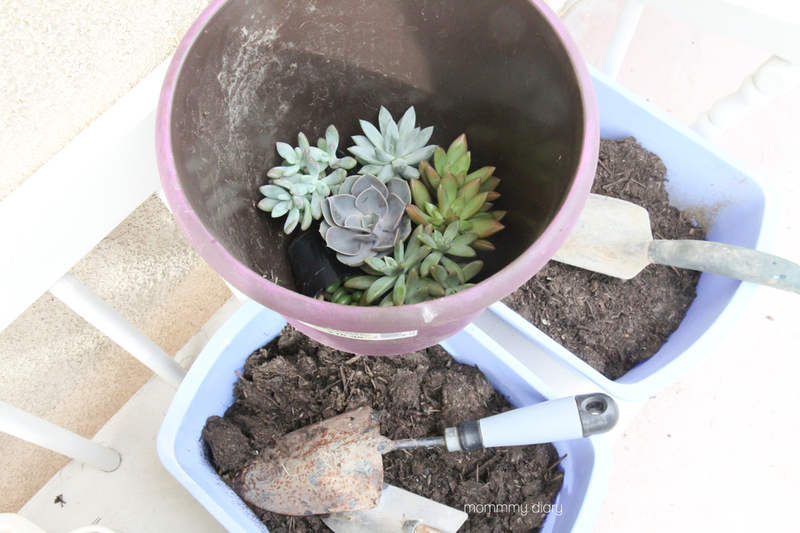 I purchased adorable character flower pots at Daiso for $1.50 each and little flowers, succulents, seeds and soil at Home Depot. The entire activity/favor cost about $5 per guest which is less than what I normally spend by going the dollar section at Target route. My 8-year old’s idea turned out to be a brilliant one! 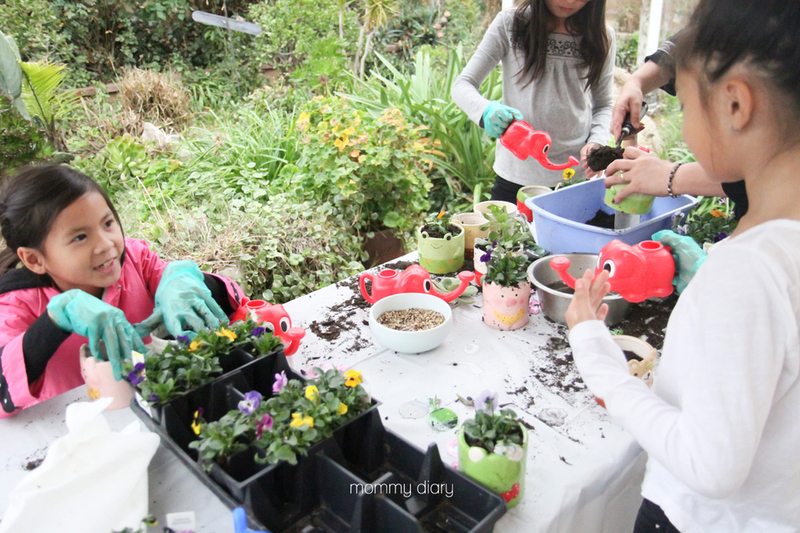 Aside from the gardening activity, it was free play for everyone. Dads played poker, moms spent hours catching up, eating and sipping on wine while all our little ones were playing, laughing and running around the house. It was a busy day for me as a host but I really loved every single moment of it. I’m starting to realize how much I enjoy hosting parties and dinners, as it brings so much joy to create occasions where people can connect, laugh, talk and share memories. 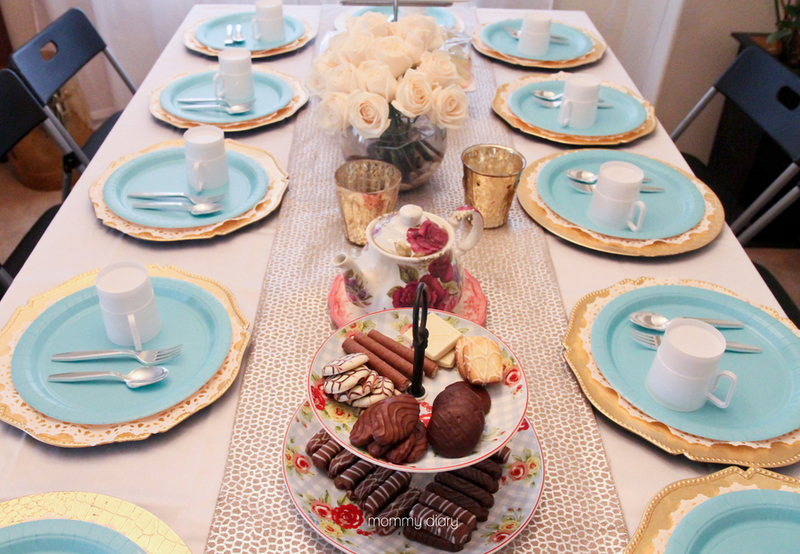 T’s tea party looks a lot fancier & expensive than it actually was. I already had the rectangular table, 12 black chairs and trapezoid tables for the candy table (Hmm, no wonder our garage is so full). 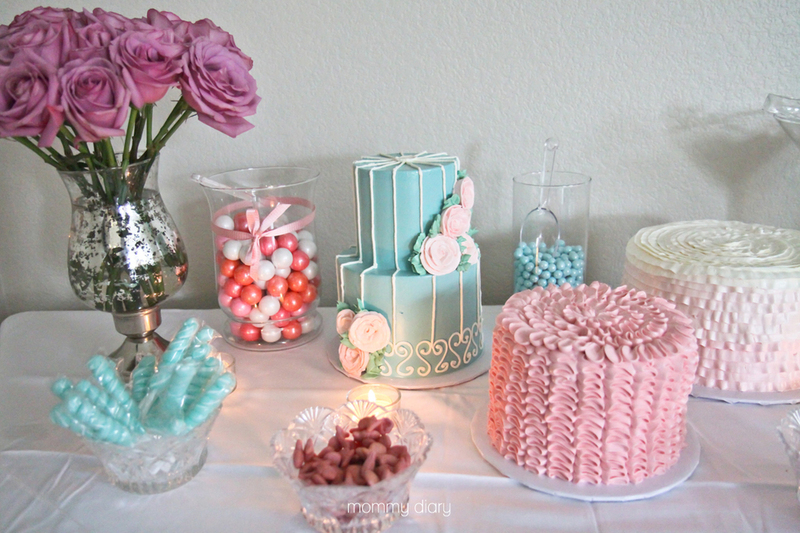 Most of our cost went to food & drinks because it’s the most important part of our party planning. We served home cooked carne asada tacos with King Taco sauce, homemade sliders for kids, mini sandwiches, vegetable soba noodles, potato salad, chicken rice, cheese & meats tray, fruits & vegetables, etc. 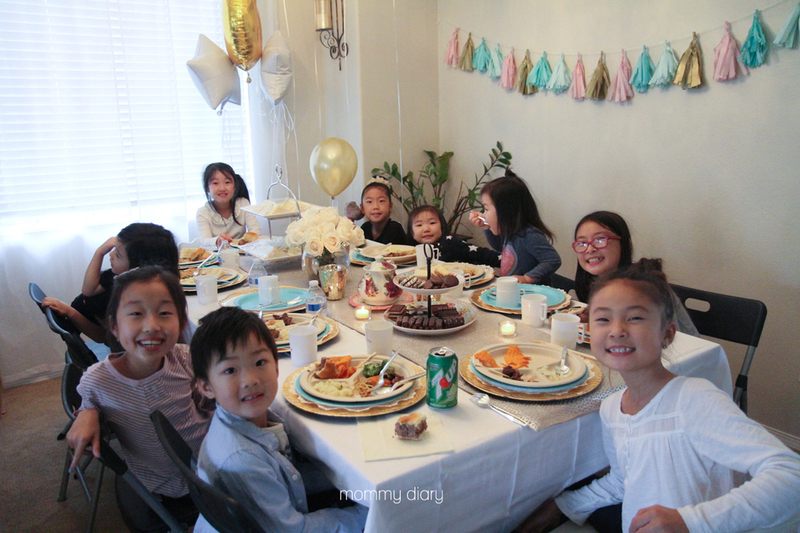 With some time for DIY projects such as banners and floral arrangements, little bit of creativity and lots of joy during the planning process, everything turned out beautifully, just like my blossoming 8-year old. Another year down, many more birthdays to share together! Personal Why I Miss (And Don’t Miss) My 20’s.